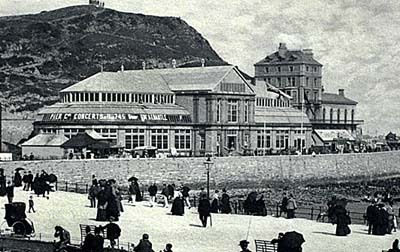 Llandudno’s Pier Pavilion, now just a hole in the ground, was the premier venue for many of the best entertainments from the Victorian period until its heyday in the 1950s. Work started in 1881 on a 2,200 seat, three-storey structure made largely of cast iron with superbly detailed decorations. In the basement was the largest indoor swimming pool in Britain, or so it was claimed! Opened in September 1886, the Pavilion was 62 metres long by 26 metres wide and 32 metres high. The canopy roof was 18 metres across. It was essentially designed as a concert hall. I n 1887 Jules Riviere, an Anglo-French composer, conductor and impresario, brought his 28-piece orchestra to the Pavilion for daily concerts. These continued under many quite famous conductors until 1936. You can read more about him on our page about his grave at Llandrillo-yn-Rhos churchyard. After a decline in the popularity of concerts, the Pavilion hosted variety shows and conferences. Performers included George Formby, Paul Robeson, Russian ballet star Pavlova, Billy Cotton, Petula Clark, Vera Lynn, Arthur Askey, the Beverly Sisters, Cyril Fletcher, Cliff Richard and Hughie Green. Politicians who attended conferences there included Stanley Baldwin, Ramsey MacDonald, Oswald Mosley, Neville Chamberlain, Clement Atlee, Harold MacMillan, Edward Heath and Winston Churchill. It is said that the young Margaret Thatcher decided to take up politics while attending a Conservative Party conference there in 1948. Closed in 1990, the pavilion was put to the torch by arsonists in 1994 and destroyed, although some of the ironwork still remains by the pier.